I recently invited a couple of girlfriends over for Sunday brunch. Soon after our plans were set, an invitation came in for a dinner on the preceding Saturday night that was sure to go late and where the wine was sure to flow freely. (Correct on both counts.) Sunday morning--and any cooking--suddenly started to look like an ugly prospect. What to do? Strata to the rescue! The truth is that getting involved in anything too fussy is rarely appealing when hosting a brunch. It pretty much defeats the purpose of a weekend morning. 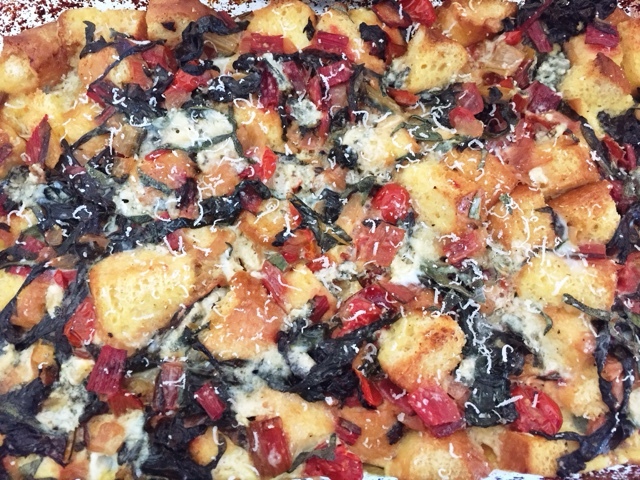 The beauty of a strata (which is basically a savory bread pudding) is that it allows you to shift all the work to the afternoon or evening before, when you’re more likely to be a lot more bright-eyed and bushy-tailed. Gather your ingredients, whisk together some eggs and milk, pile it all together and everything is ready to pop in the oven the next morning. For this version, I found some beautiful rainbow chard at the farmers market. The vibrant colors seemed like the perfect thing to brighten a brunch table, and I added a little gorgonzola for punch. I served it all with a plate of smoked salmon on the side. Mission brunch accomplished. 1. Lightly heat oil in a large pan over medium heat, then add the chopped chard ribs, the diced onions, the crushed garlic, and the red pepper flakes. Sweat until starting to become tender--about 4-5 minutes. Add the chopped chard leaves and about ¼ cup of water, cover and cook over medium/medium-low heat for another 4-5 minutes until the leaves are wilted and the onion and ribs are tender. Add the cherry tomatoes and sautée for another minute or two, until the tomatoes are just starting to soften. Season with salt and pepper, and remove the pan from heat. 2. Whisk together the eggs and milk and add a pinch of salt and pepper. 3. Grease a 13x9-inch baking pan. 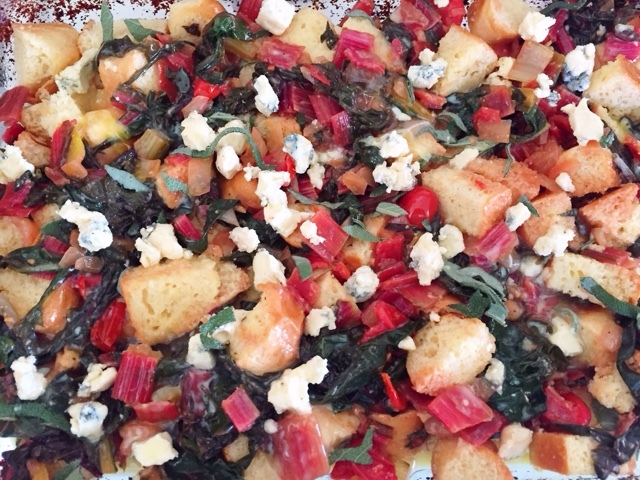 Layer on the cubed bread followed by the chard mix, and the cheese, making sure to mix and distribute each evenly. 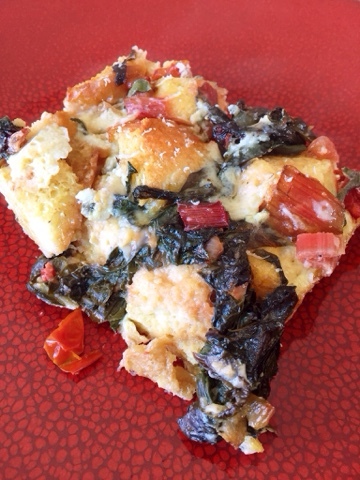 Sprinkle on the sage leaves, then carefully pour on the egg mixture making sure to moisten all of the bread. Cover the strata and allow the mixture to soak into the bread for at least an hour or in the fridge overnight. 4. If refrigerated overnight, remove the strata from the fridge, 20 to 30 minutes before you’re ready to bake it. Preheat the oven to 350°F. 6. Remove the strata from the oven, top with a sprinkle of Parmesan cheese, then cover and allow it to set for 7-10 minutes. Serve.